How much does it cost to travel to Darjiling? How much money will you need in Darjiling? ₨940 ($14) is the average daily price for traveling in Darjiling. The average price of food for one day is ₨454 ($6.54). The average price of a hotel for a couple is ₨603 ($8.68). Additional pricing is in the table below. These average travel prices have been collected from other travelers to help you plan your own travel budget. Mount Kanchenjunga, one of the world's highest peaks, steals the show of Darjeeling's backdrop. Tiger Hill is a favorite location to view the mountain, especially at sunrise when the first rays of the sun touch the snow-capped peaks. For additional information on Kanchenjunga and the surrounding mountains, visit the Himalayan Mountaineering Institute. Founded by the late Tenzing Norgay who conquered Mount Everest with Sir Edmund Hillary in 1953, it now has on display records of the major expeditions undertaken. Nearby is the Everest Museum which traces the history of different attempts on the world's highest peak. The institute also offers mountaineering courses for all levels. Sharing the premises with the institute is the Padmaja Naidu Zoological Park, featuring a habitat of animals found in the Himalayan region. As far as cultural significance goes, the Japanese Peace Pagoda represents a place of unity for people of all races and religions to gather in search of world peace. It is one of 30 located around the globe. Other impressive sights include the Batasia Loop where the famous Darjeeling Himalayan Railway (known as the "toy train") makes a loop, the Barbotey Rock Garden landscaped with flowers and waterfalls, the Mahakal Temple, and many other monasteries, temples, and cultural attractions. Darjeeling is a small town, making it very easy to navigate on foot. For longer journeys outside of the main area, taxis are available at stands near the entrance to the mall, Chowrasta. This place is pretty much the center of Darjeeling, surrounded by shops, eateries, and hotels. It is a great place to purchase local Darjeeling teas and other specialties, get caught up in the bustle, or sit back and people-watch while enjoying some tasty street food. Nearby towns worth visiting include Mirik, Kalimpong, Kurseong, Siliguri, and Gangtok. In addition to visiting the sights within town, it is also common for visitors to gravitate towards the surrounding mountain landscape. Trekking and mountain biking are especially popular, often with Singalila National Park as the final destination. The park is located in the far northwest corner of West Bengal state with Kanchenjunga, the world's third highest peak, visible for much of the trek to the north. 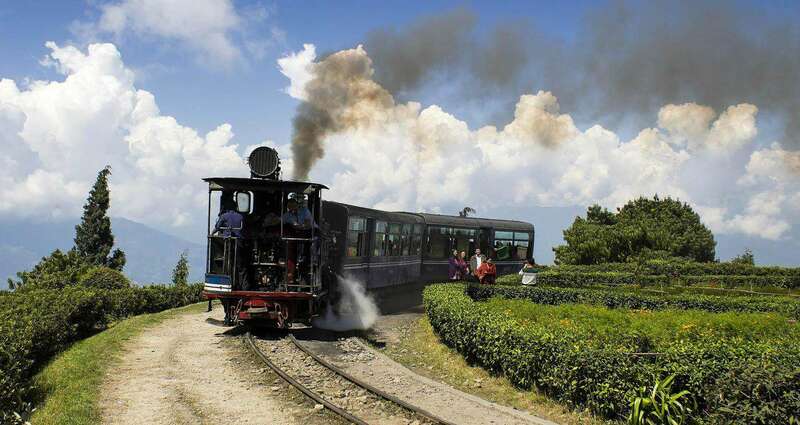 Visitors also enjoy taking scenic rides on the Darjeeling Himalayan Railway, nicknamed the "toy train," which was built between 1879 and 1881 and is today known as an UNESCO World Heritage Site. The cooking of Darjeeling largely consists of North Indian, Tibetan, and Nepali influences. Some of the most popular local specialties include things like momos, thukpa, aloo dum, sael roti, naga platter, Nepali thali, tongba, and chang. Momos are steamed or fried dumplings filled with meat or vegetables, while thukpa is a hearty noodle soup also with vegetables or meatboth are common Tibetan dishes. Aloo dum is an Indian specialty made with fried potatoes in a gravy rich with spices, while sael roti is a kind of traditional Nepali homemade sweet rice donut. Naga platter and Nepali thali are both traditional meals made up of a selection of dishes, while tongba and chang are both local alcoholic beveragestongba being a millet-based alcohol, and chang, a light Tibetan beer made of barley. Kunga's is often recommended for Tibetan food, especially the momos, and it is important to keep in mind that most restaurants will close fairly early in the evening with most of the town going to sleep by 9pm. Additionally, Darjeeling is famous around the world for its teas, which are very aromatic and have a delicate taste. The nearest airport is 96 kilometers from Darjeeling, located near the city of Siliguri and is called Bagdogra Airport. It is about 2.5 hours by road from Darjeeling, 2 hours by air from Delhi, and 50 minutes by air from Kolkata. Air India and Jet Airways both operate flights from Delhi, Guwahati, and Kolkata. Other airlines include Spice Jet, Indigo, and Go Air. From the airport to Darjeeling, the most popular modes of transport include taxi and shared jeep. A regular bus service from Silguri to Darjeeling also runs - however, the journey is much slower. By train, the nearest station is New Jalpaiguri in Siliguri. It connects the city to most other parts of the country including Kolkata, Delhi, Guwahati, Chennai, Mumbai, Bengaluru, Bhubaneshwar, and Kochi. From this station, the famous Darjeeling Himalayan Railway completes the journey to Darjeeling.